There is one common complaint that I hear from many of my married friends. I won’t lie, I have even experienced this myself in past relationship. Nothing in this world can feel more frustrating then when one of the partners is not pulling their weight. I know I have said this before and I will say it again, men are looking for a partner to marry. However, if you are not working with him to better each others lives, then he sees you as working against him and he won’t be likely to marry you. **Before I continue with this article and I receive tons of hate mail, let me just state that I know there are men out there that do not pull their weight in relationships. This is not a website dedicated to helping change men. If you want a man to marry you then he must be pulling his weight somehow. This website is dedicated to explaining why men are hesitant to propose marriage. One reason for this might be the fact that the woman he is with is not pulling her weight. With that said, let me show you a few examples of what I mean. Steve is struggling to make ends meet, but its not for a lack of trying. Steve works, 16 hours a day 7 days a week constantly wheeling and dealing. He has turned over every rock he can find in an effort to produce a better revenue for his family. The global recession has hit him hard. He has talked with this wife about her getting a job, but she doesn’t want to work she just wants to stay home and take care of the kids. That is fine, I think raising children is the most important job in the world. The confusing part is when the children are at school from 9 am – 3 pm, she doesn’t raise a finger around the house. She reads her people magazine and watches tv. You have to understand when you work 16 hours a day, 7 days a week and you are barely making any money, the anxiety, frustration and fear builds inside a man. All he needs and wants is just a bit of a helping hand. Does Steve’s wife say this? No, because Brad Pitt and Angelina Jolie are breaking up for the 20th time in people. Ryan was a highly successful businessman. Crushing million dollar deals like it was nothing. He was doing so well, his wife didn’t have to work, and they had a nanny to take care of their child, cook and clean for them. With the recession times are tough and Ryan can no longer afford to keep the nanny. Especially when his wife is not working and capable of doing everything the nanny did, at least until things get better. This would make sense spouses help to make life easier for each other, for the benefit of the family. Well, this is just not the case. Ryan’s wife refuses to cook or clean and doesn’t understand why Ryan just doesn’t hire the nanny back. Everyday his wife orders take out, which just ends up spending more money they can’t afford to spend. This woman isn’t a wife she is a leech. If it wasn’t for the child they have together Ryan would leave her and now he feels stuck because he didn’t realize what kind of person she really was. How does this hurt women like you? Ryan tells every single male he comes across to “Never Get Married!” He shares every detail of his married experience and how it has destroyed his life. So now you have a bunch of men running around in fear that they will end up in the same nightmare that Steve and Ryan are in. Being in a position where they are having a hard time supporting their families which is a very hard thing for a man to accept. The worst part is the person who is supposed to love and honor you, won’t even lift a finger to help during your time of need. They won’t even give their husband the help he needs to be able to take care of his family. I guarantee, your current boyfriend has probably heard about this kind of nightmare from at least 10 other men in his life. So this fear is swimming in the back of his subconscious mind. What you need to do is show him, that you are capable and more then happy to pull your weight in your relationship. Show him you do not shy away from doing what needs to be done to make his life easier. Help make his food, when he is working lots and doesn’t have time to cook for himself. Are there little small jobs that you can help him with for his business? If so, jump on them and get them done. If you help to make his life easier, he won’t be able to live without you. If you make his life harder, he’ll be more then happy to never propose. 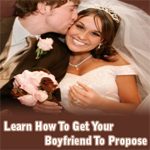 Learn more about how to get your boyfriend to propose and understand the subconscious of the male mind in regards to marriage.